I am fascinated by Borromean Rings because of their geometric properties. Unlike other triple rings you see, where every ring is linked to every other ring, Borromean rings are a fascinating mathematical construction- if you remove any one ring, the other two become unlinked. The mathemeticians and scientists in your life will appreciate the simple beauty within this arrangement... and they're not the only ones. 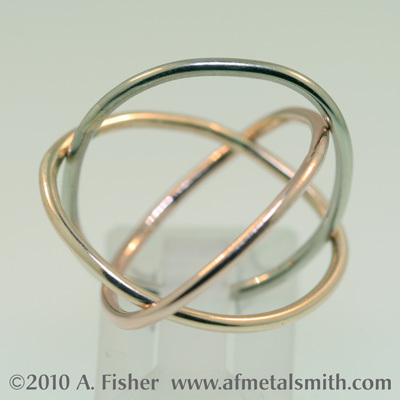 See more about Borromean rings here on Wikipedia. 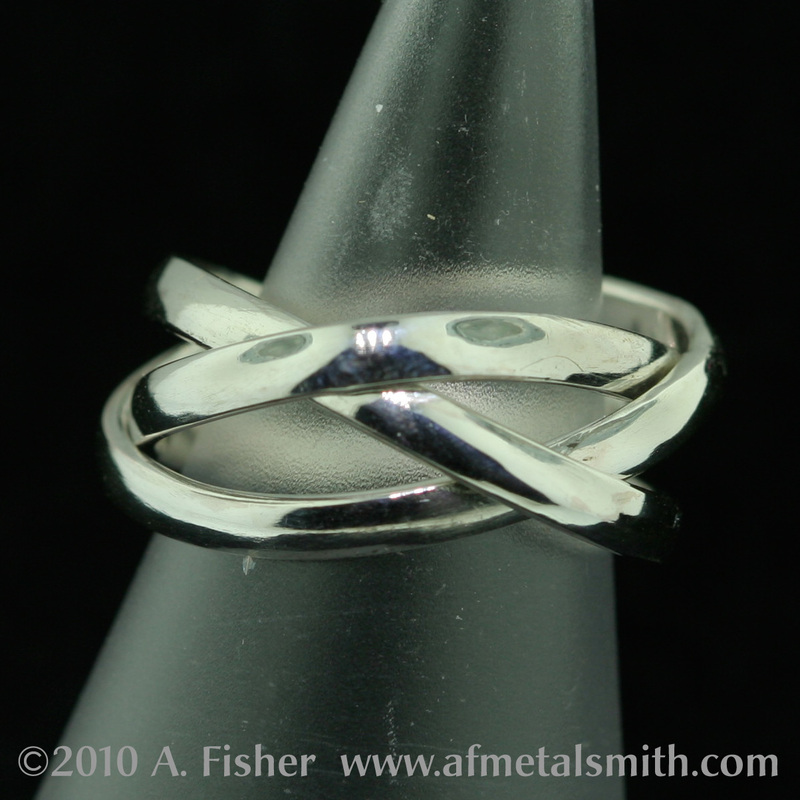 The structure of the Borromean rings makes for a very powerful spiritual symbol. Historically, they have been used to represent the Christian Trinity, and have appeared in Afghan Buddhist and Norse stone art in various forms. Even the Discordians appreciate Borromean rings, with their mandala containing five. And of course, Pagan spirituality often makes use of trinities- land, sea and sky... Maiden, Mother, Crone... heart, hand and head. Remove one of those links, and the others reduce in meaning (or, here, literally fall apart! )- one big reason things in threes also often represent strength in unity. I think it's a meaningful symbol for marriages and commitments, too: both people have their own individual lives, while there's the life of the relationship itself holding them together... and if you cut the relationship, the other 2 separate. Perhaps for you this might represent two individuals joined by their relationship, honoring separateness while also being joined together. Or, for a polyamorous triad, it could represent equal commitment from the three people involved, making up a harmonious household. Or: for people inclined towards leather lifestyles, this could represent Dominance, submission, and the dynamic. Regardless of what you want Borromean rings to symbolize, there's history backing them up as a powerful symbol of unification. On a more frivolous note- this is a really fun ring to play with! They are very happy being in either ring format, or what I call "sphere" format- describing a sphere, and somewhat similar to the conceptual drawing of electrons circling an atomic nucleus. It's great to fidget with, moving it between these configurations. So, not only a ring, but a teeny tiny sculpture as well! This version of the design is sturdier, and suitable for a man or a woman. Read more about the fascinating history and symbolism of Borromean rings here. 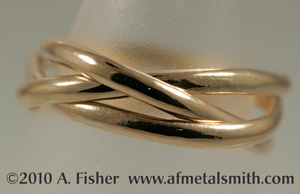 This ring design, if used for a wedding or commitment ring, is best made in gold or palladium. 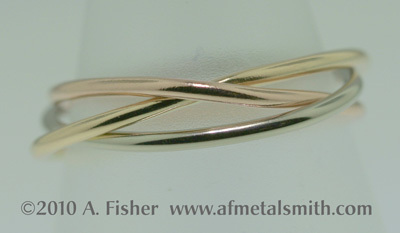 For another mathematically-inspired ring with interesting symbolism for a wedding or commitment ring, please see my Möbius Rings. 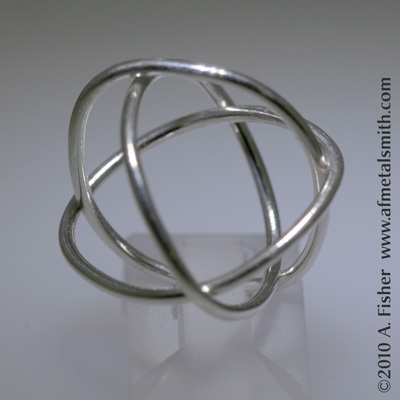 Or visit Rings on my Etsy store to see these and other rings- math-inspired and not. Gold Borromean Ring, made of half-round 14k yellow gold. The left picture shows it in ring form, the right in "sphere" form- the 2 configurations that are most natural for them. 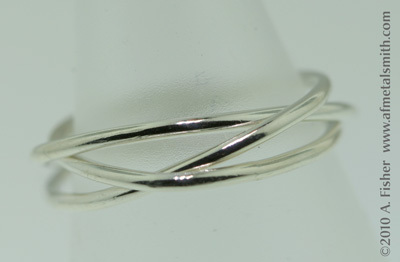 Silver Borromean Ring, made of half-round sterling silver. 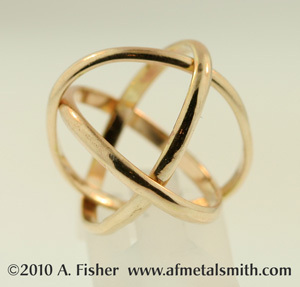 Gold Borromean Ring, made of 3 colors of 14k gold: yellow, red, and palladium white. 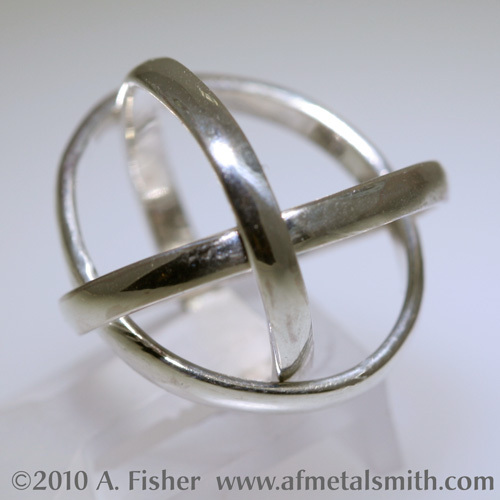 Silver Borromean Ring, made of hardened Argentium sterling silver.